The #cetis14 conference at the University of Bolton has been a great success. Although run on a self-funding basis for the first time (and consequently using the facilities of its home institution for the first time), it still attracted 100 delegates from the UK HE and FE sectors eager to talk about the impact of interoperability, cloud computing, e-books, systems integration and learning analytics. If anything, the conversation has been more eager, imaginative and focused than in previous years. This was helped by the two keynotes. The first keynote was from Phil Richards, Chief Innovation Officer at JISC. As Phil acknowledged, this was always going to be a slightly tetchy affair, since government reorganisation and JISC restructuring has meant a marked reduction of support for projects and services (like CETIS) in institutions about which people are understandably upset. Phil presented the new vision for the future of JISC innovation first by critiquing past mistakes. Quite simply: too many projects didn't go anywhere, the benefit to the taxpayer was not clear, the bidding process obscure... Stuff which I and many others have commented on before. But at the same time, I thought, the value of JISC projects was that they gave participants permission to think about education, in circumstances where this would otherwise have been impossible. It was this business of 'asking questions about education' which seemed curiously absent from the vision of the 'new JISC': it seemed that the new JISC vision is to think about keeping JISC going, not thinking about education. When explicitly asked about who in JISC was asking the 'big questions', the response given was "people above my pay grade". The old JISC was good at getting everyone asking those questions, and the conclusion is that the movement from old to new JISC is a movement from what was a 'committee' to something rather more autocratic (which kind of mirrors what's happened in our universities!). For CETIS and its diaspora, asking the big questions about education has always been the key thing. It's ironic that the movement from committee to autocracy has been facilitated by technology! The second keynote, from Audrey Watters, was the kind of wake-up call that should send all those who think about education and technology into the new academic year with renewed determination to take on the self-serving forces which are currently carving-up education. Her focus was on the 'edupreneurs', Pearson, Blackboard and co, whose chief weapon is not spectacular software or innovation (because their products are neither spectacular or innovative), but the promotion of cultural amnesia and the re-writing of history. Spot on. Audrey wants us to really think about education and technology, about how we got here, about where we are in history, about where we are going. In between the two keynotes, technically-focused workshops looked at developments in technologies and standards that will affect us all. I attended the analytics strand and helped with the session on cloud computing and systems integration led by Scott Wilson. I was sorry to have missed the session on e-books, because I'm beginning to think there's something really important in the whole issue of bounded, authored content which the messy web on its own cannot deliver. But all of these provided a permission to ask questions. Technology's value is often not in implementation, but in illumination: it provides a torch where we re-inspect ancient practices. Andrew Feenberg (who gave the CETIS conference keynote a few years ago) has commented on the need to situate technology as part of the democratic process. The question is how we go about doing this - particularly at a time when technocracy sets in to serve the interests of managerial elites. There's something important about the technical discussion in CETIS: it provides a clear focus for debate which seems strangely absent from the discourse in education more generally. One delegate commented on the difference between the discussion at CETIS and the discussions at the Association for Learning Technologists (ALT) conference, which is far bigger: "it's too general - nothing gets carried forwards. CETIS gives you new tools and ideas you can think with." So focused technical discussion does much more than address the issues of the technology. The standards discussion is particularly interesting in this regard, because standards are not about tools; they are about the 'in-between tools'. As education screws itself deeper into the ground - facilitated by the technologies it has commandeered - we should hope that the critical debate about those technologies, their implementation and development serves to give us permission to ask the questions about education that urgently need to be asked. Recently I've been thinking a lot about learning analytics, big data and all those pretty pictures of social networks that people are producing in tools like Gephi and R. There's something important about this stuff. Maybe the most important thing is it is something which fascinates us, but which is also very difficult to pin down. Is this just a variety of visualised statistics? But then, statistics has the hold it does over the social sciences because it produces something like 'empirical regularity' by averaging events, and then inferences can be made from the statistical regularities (we have understood for a long time a statistical correlation between smoking and cancer, although the causal connection has only very recently been discovered). The issue for social network analysis is that there doesn't tend to be an emphasis on establishing regularities. In which case, the visualisations do not seem to be part of an empirical effort. That means it's about something else. In place of regularity, we have visualised 'patterns', 'clusters', etc. The identification of these leads to questions about similarities between different situations which pertain to each cluster and pattern. The Triple Helix people, for example, on looking at clusters of industry and universities, will point to the discourse dynamics in those regions and the intermixing of academic labour with industrial innovation. But I wonder what Victorian biologists would make of this as scientific procedure. They too looked at pattern and cluster (for example, on a butterfly's wing), but their efforts were to establish the regularity of occurrence of pattern, identify its genus, species, etc. Unfortunately social networks are much bigger than butterflies, and the pattern of a network tends to be a one-off. However, this is not to rule out the possibility of a typology of social networks - but I don't see it happening anywhere - certainly not in the learning analytics world (and maybe it's not a good idea!). Typologies would produce a different kind of regularity. Essentially, this means that the map i¡f = i¡g --> f = g. Badiou argues that a monomorphism preserves difference. That is to say that if f and g are different, this difference is preserved in i. Monomorphic, or one-to-one mappings are related to what set theory calls 'injective mappings'. The dual of the monomorphism is the epimorphism. In an Epimorphism, we start with an identity (a single arrow) and it is followed by the possibility of difference immanent in that identity (2 arrows). It seems that the possibility of introducing difference and preserving identity in transformations between objects begins to open out an expressive power in the category theory notation that goes far beyond the simple 'connecting' of points. Thinking in this way introduces its own algebra, but an algebra which embraces the degrees of uncertainty and absence which get lost in our fascination with social networks. The algebra begins to appear when we start to think about how the mappings between objects might be viewed from other objects. For example, it is a common situation in a social network for a node to have a number of points pointing at it. In category theory, we can speculate on the objects which sees all these other objects. Such a situation where there is a central object which can see the other objects and which presents the internal logic between those objects is a kind of universe called a 'Topos'. If we look at a social network graph as a Topos, then we examine its topology asking "who can see what? ", "what is it like to be an inhabitant of this topos?". But more importantly, we cannot ask those questions without asking of ourselves, "where am I in this topos?". That, to me, is the really important question - and the reason why category theory may provide a solution to the mystery of why we are so fascinated by these topologies. Category theory is a mathematical formalism that can be used to represent many aspects of mathematics within a coherent framework that uses 'mappings' (i.e. arrows) between objects (i.e. points). It was formulated by Saunders Mac Lane in the 1940s - that is, at the same time as other remarkable mathematical and technological developments were taking place which led to the development of Cybernetics (from the Macy conferences in 1948) and the succeeding developments that span out of Von Neumann, Wiener, McCulloch, Shannon, Mead, Bateson and Ashby in economics, computer science, telecommunications, psychology, psychiatry, anthropology, philosophy, education, art, management science, and so on. The metaphor of 'mapping' would have found particular resonance with the functional transformations and feedback loops of computers, and indeed, Category Theory has its strongest foothold in computer science departments as an important formalism for thinking about algorithms. My first encounter with it was when trying to understand some fascinating work by Louis Kauffman on "Time" at the American Society for Cybernetics. Kauffman presented a way in which time could be seen to be immanent in processes of perception, producing an elegant description that showed how the square root of minus one could be seen to be a "clock". Powerful stuff but quite challenging in the depth of its implications and importance (I am convinced that 'time' is one of the biggest problems in cybernetics - no mechanism works outside time! - and I'm not entirely convinced by Kauffman's explanation, but no doubt my understanding will deepen). My reticence in accepting Kauffman's description of time partly revolved around my suspicion that cybernetics has not been entirely successful in dealing with 'absence'. Bateson wrote well about absence, but I still felt that the whole business of cybernetic 'difference' is too 'singular'. Differences to me are never 'points' - they are always surrounded by a context, much of which we can't see. Differences have dark matter. But then a curious coincidence was encountering Alain Badiou's work. There's much in Badiou which is consistent with Critical Realism, which I have been interested in for a long time (but which also has some problems). Most importantly for me, Badiou too has dealt with absence. Equally important, he has taken on the problem of 'difference' - or what he prefers to call the 'event'. But the really cool thing about Badiou is he knows his maths - and in recent years, the branch of maths he has done most of his work is Category Theory. It's always when I get the same thing from two different places that I start to take a serious interest. Since then I've been reading Badiou's recently published "Mathematics of the Transcendental", whilst glancing at Lawvere's "Sets for Mathematics" and other texts. Understanding emerges only slowly with this stuff. But the DIAGRAMS are fascinating. Here we have networks of lines and algebraic interpretations which say things about absence, and being. In fact, Lawvere has even written recently about Category Theory being able to characterise "becoming": phenomenology has always suffered from a lack of formalism (although Husserl's wrote some fascinating things about geometry). "we have, hopefully only temporarily, relinquished our responsibility to ask for a technology that will solve existent problems. Instead we have allowed existent technology to create problems it can solve." That was before the internet. Things are worse now. The question is how to think about our existent problems. The problem is that technology is part of our existent problems. Social network diagrams and our poor understanding of what they mean are part of our existent problems. We need better ways of reasoning about the world, and by extension, reasoning about technology. That means using our analytical and critical capacities to dig into the underlying logic of what is happening to us. Maybe Category Theory can provide a way of doing that. With apologies to René Magritte and @paulhollins (who gave me the idea) I think it is useful to be reminded of the distinction between reality and pictures. We are currently investing certain pictures (not unlike the one below) with mystical properties which we believe grant privileged access to an 'objective reality'. This was Magritte's target when he painted his pipe: but for him it was a clever joke about mimesis and representation. For us, and for the pictures we now confuse with reality, the consequences are more serious: policies are made by looking at such pictures, people will get hurt, others will get rich and some will get elected. Having said this, it is not quite the same joke as Magritte's, because the pictures of social networks can lead to actions whose consequences appear to be consistent with the logic of the picture. This is to say that a social network picture is a 'logical representation': one whose formal characteristics are isomorphic to lived experience. The question about the nature of a social network picture is a question about the relationship between reality and its logical representation. It is analogous to the relationship between geometry and the natural world. Descartes saw geometry precisely in this way: that activity of the mind which connected with the body to produce relations which were isomorphic to transcendental reality. 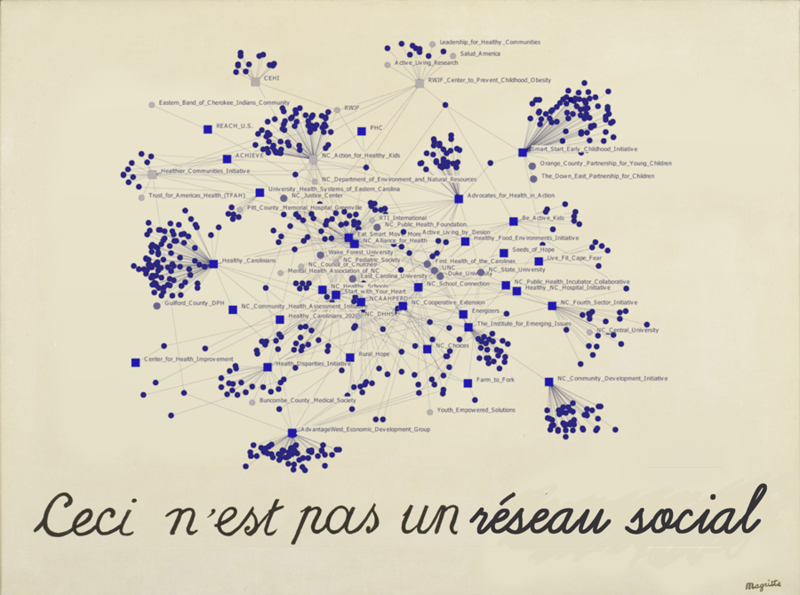 I think it is awareness of the connection to the transcendental which is missing in the contemporary obsession with social network graphs. We have forgotten about our bodies and we have forgotten about what we cannot know. 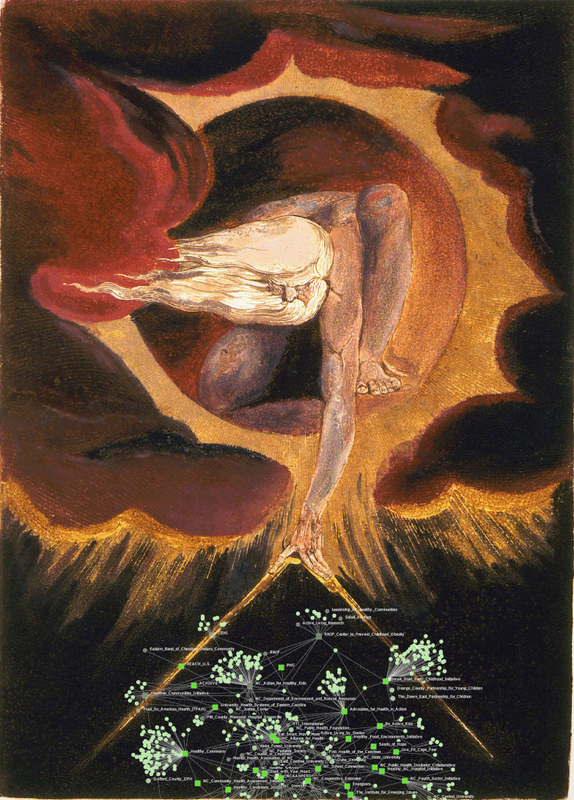 The connection between the transcendent and measurement is beautifully expressed by Blake's "The Ancient of Days". I would suggest that instead of measuring the heavens, Blake's Urizen (the bearded man) is now measuring pictorial depictions of reality. That's what the social network analysts are doing. The irony of this is that Urizen represents rational man. Instead of rational man encountering the heavens and constraining them with his compass, he now encounters the artefacts of his own technological making, similarly and vainly trying to constrain them too. We appear to have gone up a level of recursion! But geometry and its relation to the transcendental haven't gone away. When we look at a picture - particularly a picture of labelled nodes and arcs - we are examining a logical structure and piecing together its inherent logic. In so doing, we re-encounter something fundamental about the relation between logic and the natural world, and in this case about the relation between geometry and the natural world. Geometry is literally "earth-measurement": that means it is precisely at the point of encounter between reason and experience. Whatever reason can bring to bear on the geometer's constructions, experience and the body moves in harmony with it. Geometry, fundamentally, is an art of harmony. Is it so fanciful to suppose that the earliest geometers (and the ones whose work most closely resembles our social network analysts) were the astrologers for whom the 'music of the spheres' played such an important role as they examined the starry heavens? When we take those social network geometries and we apply the logical reasoning of formal techniques like category theory, we may be able to uncover something of the territory of our experience of those graphs and pretty pictures. At a time when we are so confused about the import of the miraculous and enchanting pretty pictures that our technology presents to us, revealing the deeper logic behind those pictures as the logic of our experience might be extremely valuable. At an illuminating presentation by David Knoke at the Triple Helix Workshop (http://www.triplehelixassociation.org/) last week, I found myself staring at his diagrams of nodes and arcs and asking myself "but what is this about?". David is very much alive to the question (the current trend for big data pictures can be frustrating and confusing) but "what is this about?" has remained one of the biggest questions as I think about the impact of technology on education. The problem is that these diagrams have a veil of empiricism about them - as if they in some way grant an objectivity to social processes which we have traditionally regarded as subjective. But empiricism is about event regularities. Where are the regularities? Something David said then prompted what felt like a light-bulb moment. "Here we have a social structure" he said pointing to a diagram. That was it. "It's not a social structure. It's a logical structure. The meaning we attribute to it arises from our exploration of the logic.". "But I think there there are relationships expressed in those diagrams," said another attendee. "No, I said. This is a relationship between you and me now. That's a picture." I don't know what David thinks, but I found the exchange to be the highlight of the conference. There is something fascinating about the Triple Helix dynamics between Universities, Government and Industry. At the conference I found people on the whole rather too receptive to simplistic explanations for complex phenomena (such as the clustering of industry and universities), and unwilling to engage in deeper critique (a point made by economist Mark Casson who laid quite a few powerful blows to the Triple Helix idea). But on reflection, Triple Helix embraces my own concerns of the relationship between society and eduction, together with the prime importance of economics. But it needs more self-critique. The fundamental question is, What is the nature of the critical inquiry? Is it an analytical inquiry? Is it an empirical inquiry? Is it political (there was a distinct absence of politics - which bothered me)? Is it phenomenological? This led me to think about Badiou's fundamental question about the relationship between the analytical, critical (i.e. Marxist) and phenomenological. But more interesting is Badiou's method which is to turn to a logical investigation using mathematics. In his book Logics of Worlds, he turns to Category Theory as a way of looking at the ways that events relate to thought and action. I've come across Category Theory in other contexts, not least in Cybernetics, where it is the favoured tool of Louis Kauffman as he explores the deeper recesses of cognition and perception. Category Theory has also been influential in computer science, and become a popular way of formalising algorithmic structures. Badiou's take on Category Theory is, I think, the most profound. It is also the most accessible, since he has recently published his mathematics introduction as "The mathematics of the Transcendental". As I turn the pages of this remarkable book and examine the diagrams of function mappings, pushouts and pullbacks, etc, I couldn't help thinking about David Knoke's diagrams. I don't fully understand any of this yet. But if there is an understanding of social network analysis to be had, I am more convinced of the importance of the ways in which we read logical structures. Fundamentally, it's all a bit Cartesian. Of course, that tends to be taken in a derogatory way these days. But Descartes was doing something very important in the "Meditations" and the "Discourse on Method"; and the relationship between geometry and thought is perhaps something that we should be thinking about more carefully as we get swept up in pretty diagrams.